Introduced in 1992 with the EVO 1, the Mitsubishi Evo evolved over successive years, starting with a longitudinally mounted engine, becoming transverse in 1996 with the EVO 4 and gaining AYC, becoming wide arched with the EVO5 in 1998, gaining an ACD with the EVO 7, through to the EVO 9 in 2005, all being powered by the 4G63 engine, before the final EVOX being powered by the new 4B11T engine. Many models were available over the years, with most being either a GSR or RS model. The RS models usually featured stronger plated rear diffs, and made do with more basic interiors such as non Recaro seats and wind up windows. In the UK we had various models including FQ300, FQ320, FQ340, and FQ400, as well as 6 speed MR models. All EVO 1 – 9 use a variation of the 4G63 engine, with numerous detail changes through the years, with the general rule of later engines being more reliable. (We generally recommend EVO 8 engines when transplanting). The last of the 4G63 powerplants as fitted to the EVO 9 also gained MIVEC variable valve timing. With all stages of upgrade we replace the std Mitusbishi ecu with an AEM Infinity ecu. (or Series 2) This state of the art ecu comes with a wiring harness that plugs into the original engine loom to make installation very simple! We do in addition use either the plug in Motec or Autronic ecu’s but our preference is for the vastly superior AEM Infinity. The main reason for changing the ECU is the increased mapping capability, the limitless tuning potential and the extra functions we gain from doing so. Usefull additions such as ECU 12 position variable boost control, (no need for fussy external boost controllers!) through to Launch control and advanced data logging along with the ability to use “CAN data” electronic dashboards linked directly to the AEM Infinity, make the original ecu seem rather outdated! Drivability and fueling accuracy are of course vastly improved, wide band closed loop fueling feedback is standard, along with usefull engine protection features, such as low oil pressure engine shut down and lean AFR limp home strategy to name just a few! The 12 position ecu control also enables us to give you map settings suitable for wet use, dry use, track day settings and even a santa pod “balls out” setting. All selectable from a dash mounted 12 position rotary knob connected to the AEM ecu. It is impossible to give a set Stage 1 - 3 route as we do for our Cosworth Tuning because there are such a wide range of variants. 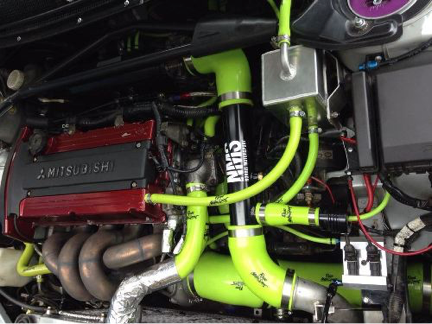 All Evo’s come with a variation of TD05 turbo with Evo4 onwards using a twin scroll exhaust turbine format. There are various compressor sizes fitted across the range from 60 – 68mm including many hybrid versions from the usual Turbo companies, but regardless of the compressor size fitted, all TD05 based turbos suffer with high exhaust back pressure over 400bhp, so consider this the maximum sustained power available with a hybrid TD05 and the sensible limit of the std Con-rods. With this format of turbo we usually run them around 1.8bar boost midrange tailing to 1.5 bar at the limiter. (As long as compressor wheel is large enough) At higher boost levels and due to the age of the vehicles now, we always advise new water and boost hoses along with a new alloy radiator and intercooler. If the clutch is on it’s limit we also fit a new uprated twin plate clutch with new flywheel. The next upgrade in order to reliably achieve more power is to change the standard con rods for our own designed H section forged steel rods, made exclusively for us by Farndon Engineering, here in the UK. Unlike most Mitsubishi tuners, at this power level our Farndon con rods feature an interference fit little end to allow the use of Mitsubishi pistons. The reason for this is because the std pistons offer quiet operation with no piston slap, and vitually no oil usage. This is a far cry from the usual aftermarket rod and piston job that most tuners fit to an Evo. We personally would’nt want to hear an Evo engine with piston slap, especially at this power level, so there’s absolutely no excuse to use anything other than the original Mitsubishi pistons! We have fabricated our own tooling to allow removal and fitment of the original Mitsubishi pistons, so if you happen to have a low milage engine, re-using your original pistons is an option, or you can of course have a new set of genuine Mitsubishi pistons fitted to your new Farndon con rods. Whilst we always recommend removing the engine to do this, so that the block face can be remachined (because the block face sinks between cylinders), we can perform this operation in situ, by simply removing the cylinder head and sump. Our new H section con rod’s are available in various lengths, and this allows the compression ratio of the engine to either remain standard or be lowered depending upon power output and fuel type being used. Typically we use a Garrett GT30 of appropriate size on a large bore tubublar manifold with external wastgate and new down pipe, and depending on injector size and other supporting mods on the vehicle 450 bhp is typical on a standard car. Power gains above 600BHP are completely achievable, however it would be best to contact us to discuss your project and advise accurately what is requirements for this sort of power. For more information you can also take a look at out engine builds section which talks more about what we do to build engines which can produce this sort of power.